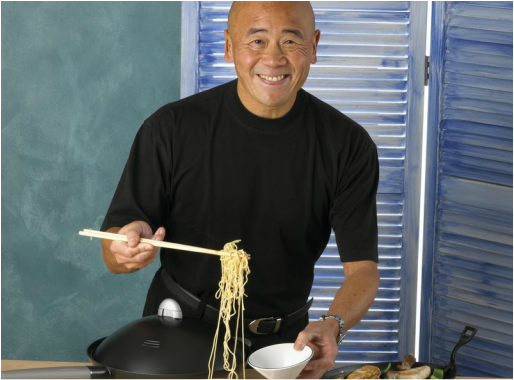 Ken Hom is a well known and well-respected chef across the globe. His expertise in food and taste drives his passion to come forth in every way. He is a fantastically profesional and credible spokesperson with a lovely sense of humour. Below you can find one of the interviews he recorded with the BBC, talking about Chinese New Year and how Chinese food can really brighten up your diet. If you're interested in a chef for any radio or TV interviews please get in contact with us. Ken Hom, who resides in France and in Thailand but travels tirelessly all over the world, continues to appear regularly as celebrity chef, write new books and keep an involvement with restaurants worldwide. An ambassador of the GREAT Campaign, the government’s international marketing campaign showcasing the best Britain has to offer, he has also lately been supporting the campaign at Milan Expo this year. Since its inception in 2012, and thanks to his supporters, the campaign has delivered a £1.2b return on investment up to March this year, and the UK is now expected to welcome 42m international visitors by 2020. His recently opened 92-seat MEE restaurant located within the Copacabana Palace in Rio de Janeiro in Brazil, the city’s first luxury pan-Asian restaurant, has already been awarded one Michelin star less than 12 months since opening. His latest book – Truffles – released in November 2014, is the updated version of his book ‘Truffes’ first written in French in 2000 with Pierre-Jean Pebeyre of France’s legendary Pebeyre truffle family. Never before seen in the UK, it is now published in English, unveiling and dwelling in the mystery of the world’s most sought after scented ingredient, the black truffle, with enticing East-West recipes. The book has just won the Gourmand Award 2014 for ‘Best Mushroom Book’ category – USA. It now goes forward to the Gourmand’s global awards which will be presented in June 2015. His last BBC TV series: Exploring China: A Culinary Adventure, and accompanying book quickly established themselves as the culinary hits of Summer 2012, and were both award winners in 2013. Shown at the peak viewing time of Sunday night, during the UK’s Olympic year, when no other culinary programme had traditionally been shown, the series attracted an unprecedented number of viewers. Travelling over 15,000 km and with over five weeks of filming in China, Ken said: ‘During filming I learnt and discovered so may new tastes and flavours which continue to inspire my recipes and meals. Part of the joy of filming was going not only to great restaurants, but into real homes, joining in and cooking with the family’. 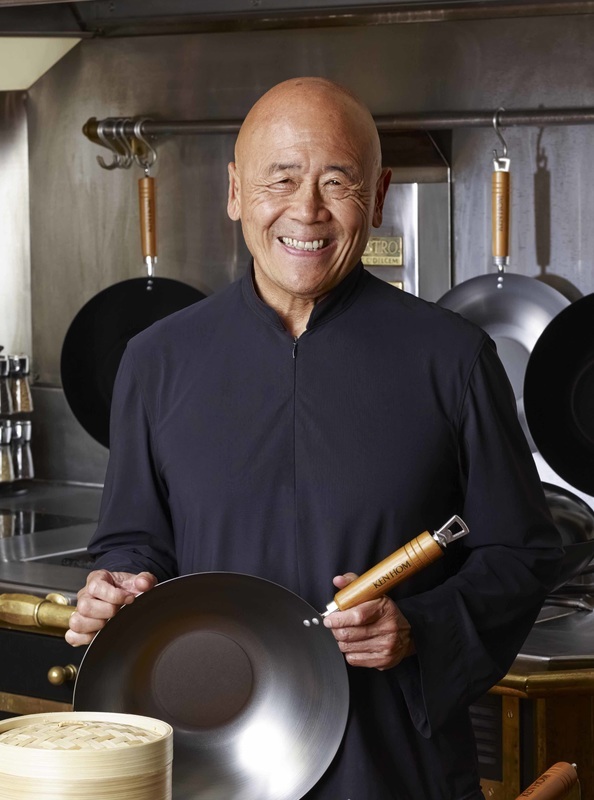 In 2009 he was awarded with an honorary OBE for ‘services to culinary arts’, recognising his achievements and the impressive social and historical impact he made on the way the UK has ‘adopted’ Chinese cuisine, which has now become one of the nation’s favourites. In 2007, he was awarded with an honorary doctorate from Oxford Brookes University for his ‘outstanding success within the international food world’ and to recognise him as one of the world’s most notable chefs with a highly successful career in the media, as an entrepreneur and as a supporter of charity and education. At that time he was also appointed as Founding Patron of Oxford Gastronomica, the Centre for Food, Drink and Culture at Oxford Brookes University. Since 2008, he has become an ambassador for Action Against Hunger, the humanitarian charity which works in over 40 countries helping families to feed their children and build a sustainable life. Ken Hom also tirelessly supports several other charities, including Prostate Cancer UK, raising awareness of the need for early detections. He was diagnosed with prostate cancer in 2010 and has since made a successful and full recovery. Widely regarded as one the world’s greatest authorities on oriental cooking, he presented a documentary on the origins of noodles, ‘The Noodle Road’. This five part documentary series for KBS (Korean Broadcasting Service) was a huge success when broadcasted in early 2009 and the series has been sold to over 25 countries around the world, winning several awards, including the prestigious Peabody Award in 2010.